1) Kyle Wright (RHP, Vanderbilt) will likely be the Twins pick at #1 overall. It won't be because he's the best pitching prospect, that's most likely Hunter Green, but the Twins may think that Wright is probably the best pitching prospect who still doesn't have to return his prom tux. He's closer to being ready, he has good velo (not elite velo), and he has a good, aggressive curve. Looks like a solid prospect without a #1 ceiling. Vanilla pick, but it's the Twins. 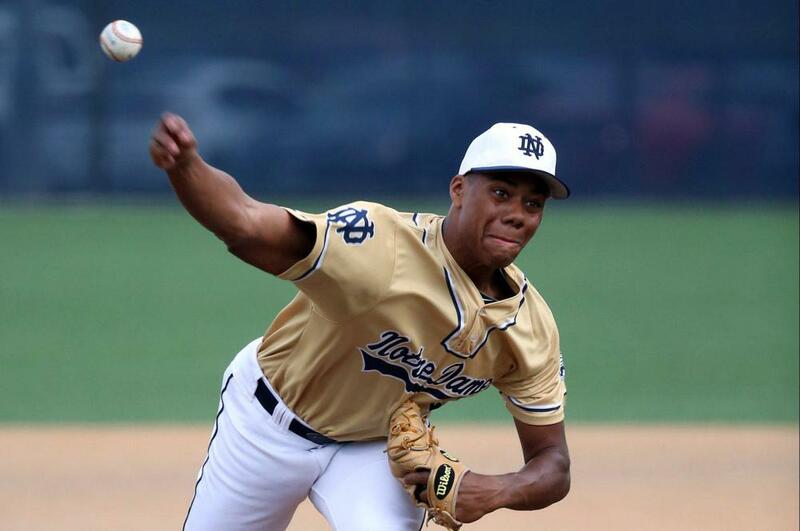 4) Hunter Greene (HS Notre Dame) would like to be the first prep right-hander to be picked #1 overall and while most believe the Twins will pass, I find it hard to believe that the decision isn't keeping people in the Twins organization up nights. As a shortstop, Greene is ultra-athletic and highly advanced defensively. Hitting? He's a high school kid. Who knows? But I think the point is moot. Hunter will be drafted as a pitcher mainly because there's nothing at all projectable about his triple-digit velo. It is real. It exists. It's here now. On top of the velo, his fastball has sink with life. He's raw, and there's a long way to go but there is a killer starter in here if someone can bring along two more pitches. Did I mention Hunter is athletic? That should help his development. High ceiling. If you can have your pick of anyone in this draft, I think Hunter is my choice. 5) The next best HS pitcher may be MacKenzie Gore out of North Carolina. Gore is potentially a two-way question as well, but few seem to think of him as anything but a toolsy, athletic dirt dawg pitcher who is hungry to get better. Right now he brings some smooth mechanics that produce the kind of low-effort delivery that could be repeatable, which leads to command, which helps his good, not great, velo play up. Not a super high-ceiling guy, but a team that develops pitching well could make something out of Gore. 8) Jeren Kendall out of Vanderbilt is a similar player, just further along than Jordan Adell. While Adell is more of a power guy with speed, Kendal is definitely a speed guy with potential power. His speed is a legitimately a plus-plus tool which also makes him a strong defensively. He seems to have sneaky power for his size but it's fair to question how much of a power game he'll eventually have, let alone how much he'll be asked for. If we base his value on his speed, you would like to see a better approach with less swing and miss. That weakens his floor. 10) Honestly, I wouldn't be shocked if Adam Haseley (OF Virginia) was drafted anywhere between the top 5 and the top 30 picks. The prototypical 5-tool player who is not really potentially great with any one of them. Nice player but he may be a tweener. He's probably not good enough defensively to stick in CF and he may not develop ideal corner outfielder power. Doesn't strike me as a large market everyday player. Let's see where he lands. 12) High School right-hander Shane Baz is also one of those players with a wide range of possible draft positions. He's the type of pitching prospect that someone usually gets smitten with and reaches for him. He has got a sinker which is really, like, you know, kind of cool these days, and he has some velo. The ball also comes out of his hand, he has a live arm, his ball pops, or whatever your preferred phrase is for "He's got some zip." Someone could think their development team could do a lot with him and I agree ... But it will need to be the right development team.